” As I Recall … JACKSONVILLE’S PLACE IN AMERICAN ROCK HISTORY,” is a reflective look at some of those responsible for the placement of Jacksonville, Florida on the universal map of rock and roll. This autobiographical account of personal and professional triumph and tragedy takes the reader through the formative years of both Lynyrd Skynyrd and 38 Special, recounting those days when making records was only a dream. Former 38 Special stage manager and co-writer, Larry Steele, gives a first-hand account of growing up on the Westside of Jacksonville, of forming his first band with Allen Collins, and of the journey they each pursued, where scores of novice musicians sought a better way of life. Steele describes his own experiences as a musician, along with the friendships that would endure the rivalry which existed between his own band and those who would eventually become Lynyrd Skynyrd. After years of performing with various bands in the North Florida area, including a brief stint with Skynyrd in 1973, he would begin his employment with 38 Special in January, 1980. From here is chronicled the 38 story from its very beginning: the frustrations of living in the shadow of Skynyrd while trying to perfect a sound of their own, and their decision to push forward after the tragic loss of their friend, brother and mentor, Ronnie Van Zant. From the rehearsal hall, to the recording studios, to headlining the most renowned concert venues of North America, Europe and Japan, take a ride on the buses, planes and bullet trains that took them all the way there. After reading “As I Recall”, I not only learned about the evolution of the Jacksonville music scene that I had previously been unaware of, but realized the answer to the question that I had been asked so many times. It is right here in his book. Get it, read it, and groove on the history of Jacksonville music as created by the Allman Brothers, Lynyrd Skynyrd, 38 Special and so many more. 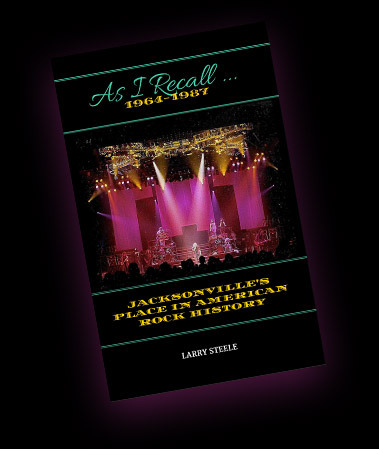 In an honest and fascinating memoir, Larry Steele has captured what life on the road was like for America’s southern rock bands, from their humble beginnings in Jacksonville, Florida, in the sixties to their phenomenal success in the seventies. Steele toured with many of those artists, and his unique insight shines a bright light on the behind-the-scenes lives of members of Lynyrd Skynyrd, the Allman Brothers, and 38 Special before the fame and before the fortune. This memoir takes the reader on a rollercoaster ride through the highs and lows, fights and reunions, and into the daily lives of band members—from recording studios to tour buses and then onto the stage. I have never before read such an honest portrayal of the good and bad times that accompany a rise to stardom. From Ronnie Van Zant to Duane Allman to Don Barnes, Steele paints an incredible portrait of an era of musicians who cut their teeth in the same small bars and eventually went on to achieve stardom. It also chronicles the rise of southern rock from the perspective of a musician/songwriter who was actually there. 5.0 out of 5 stars Everyone who loves southern rock history should get on this ASAP. No Regrets! I’ve gotta say…., this one kept me after it till I finished it! If you’re a music fan and especially a southern rock fan, then you already know that a plethora of history comes from the southeast and more specifically, Jacksonville, Florida. Larry’s recall did more than just establish facts and dates, etc. It was a window into the world of some of southern rock’s elite. He eloquently personalized all whom he had crossed paths with, grew up with, fought battles with, failed with, and ultimately, succeeded with. From growing up together as restless kids looking for a way out, to discovering the love of music and the camaraderie that comes from sharing the determination to succeed as a band. By the time I was a quarter way through the book I was already feeling like I knew these guys. My love of southern rock has always had a link to the lyrics and the realness of what some of these folks wrote. I like to call it “Gut”! I think Larry was able to uncover and reveal the inner workings, the gut, the enormous conviction that it took to achieve credibility in the world of rock n’ roll, and then maintain it despite the perils that it heaped on everyone involved. There’s not many emotions that are missed or glossed over in this one of a kind piece of history. Thanks Larry for taking me along to relive some of your great memories. Y’all read this one right away!! For a kid that grew up mostly in New Jersey (lived in Summerville, South Carolina from 76 to 79), this booked sucked me in instantly. My family traveled down to Florida every summer to visit my grandfather. Larry writes in a way that gave me that feeling I had as a kid looking out the window of the car. He reminded me of my favorite movie “In the Heat of the Night” with Rod Steiger and Sydney Poitier. It just puts me in the South and makes you feel like are there, living it with him. I read this book in two sittings (don’t tell my boss). I am an extremely closed minded person when it comes to music, movies, books…etc. I have to really like something to say I like something. And I REALLY enjoyed this book. It is NOT another “I knew Skynyrd” book. It’s simply the observations of a guy that was scratching and clawing to make it in music, just as the others were and tells their story from his viewpoint. Read this book, you won’t be disappointed. 5.0 out of 5 stars You want to know how it all got started? Certain towns across the U.S. have become hot beds for rock n roll music to spring up from. One town in particular, Jacksonville, Florida, became the shot heard all around the world! Mr.Larry Steele not only wrote about it but more importantly actually lived through it. His detailed recollection starts out in his youth and witnesses the formations of bands like Lynyrd Skynyrd, 38 Special and others. Mr.Steele would not only partake in the early versions of Skynyrd and 38 Special but would eventually go on to being 38 Special’s stage manager and would tour the world with them. Awesome book. I love his point of view. Larry was right in the middle of the music tornado that came out of Florida in the 60s and 70s. Please check out Larry Steele’s incredible web site and while you are there, order a copy of his amazing book, As I Recall. I cannot recommend both more highly. Through his words you will journey back to the magical days of the Jacksonville, Florida music scene with a talented man who was an integral part of it all. Larry takes you into the behind-the-scenes lives of members of Lynyrd Skynyrd, the Allman Brothers, and 38 Special before the fame. He walks you through the trials and pain, hard work and dedication it took to achieve stardom. As I Recall chronicles the rise of southern rock from his personal perspective, a talented musician/songwriter who was actually there, who lived it, was a huge player in it all. Larry was a participant in the early versions of Skynyrd and would eventually go on to co-writing some of 38’s most memorable songs and becoming their stage manager, touring the world with them. I found it hard to put down and in fact, have re read it 3 times discovering new gems I missed with each read. Thank you Larry for this gift to those of us who love the Jacksonville music scene, the musicians, the bands and the songs that defined an era and mean so much to people like me. 5.0 out of 5 stars Great book! I rated this book 5 stars because it tells Larry’s story and story of 38, Skynyrd, Hatchet, Blackfoot, and all the rest of the Jacksonville musicians, the way it was during that time. I know this because I was privileged to know a lot of the people involved and was witness to a small piece of it. Lots on 38 special. Quite a good read. Wish there was more on hatchet and Blackfoot. I graduated high school in 1974 in upstate NY. My friends and I were rabid fans of southern rock. We had a band and covered Skynyrd. Outlaws and of course, 38 Special among many others. I found As I Recall an extremely interesting and engrossing read. Larry spoke of several shows he worked where I was in attendance and the book transported me back to the glory days of southern rock. It was extremely interesting to learn how much blood, sweat, tears, muscle and emotion it takes for the road crew to pull off 200-300 shows in support of a new album. The author described good times and bad times on the road, but from what I gather, it was mostly a blast. The author also takes his time explaining how and why Jacksonville spawned so many bands. He explained the intricacies of friendships and camaraderie that were integral in the formation of so many killer bands. At 547 pages, I found the book to be a quick read because I just couldn’t put it down. The author got me caught up in the whirlwind lifestyle of rock stars and the indispensable road crew. It was a fun and educational read and my only wish was that it didn’t have to end. Let me start by saying this is ONE OF THE BEST BOOKS I HAVE EVER READ!!!!!!! I am an avid reader. I always have a book with me. I kept hearing how this was one of the Best Books ever written about Southern Rock Roll. I was a little hesitant in reading it because I did not know much about Rock and Roll. It did not matter. Steele weaves a story like an artist. I compare him to the likes of Pat Conroy. The accuracy, explanations and humor kept me mesmerized. His book has made me look into their bands and learn their songs. Mr. Steele has an amazing gift as an author and I hope he will write another book! I grew up in Jacksonville on the Westside during this time when every boy wanted to play guitar. It influenced my love for music which has remained true to this day. I was blessed to go to Lakeshore and Robert E. Lee and to know Larry and many of the people in the book. Larry’s recollections of this time were excellent. The insights into the highs and lows of the music industry were fascinating. I could not put the book down and plan to read again. Anyone who loves music should make this a must read book. Thank you Larry for all the memories. I hope to you again one day to shake your hand and personally thank you.